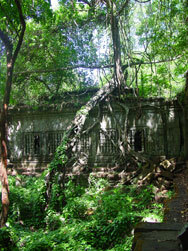 Beng Mealea, its name means "lotus pond" is a temple in the Angkor Wat style located 40 km east of the main group of temples at Angkor, Cambodia, on the ancient royal highway to Preah Khan Kompong Svay. 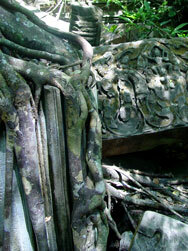 Sprawling jungle temple covering over one square kilometer. 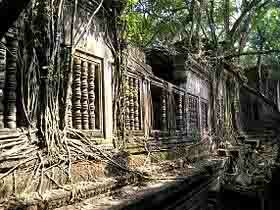 The temple is largely overrun by vegetation and very lightly touristed, giving it an adventurous, ‘lost temple’ feel. 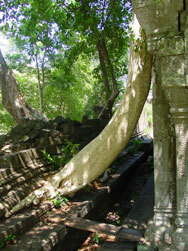 Photographers: trees growing from the broken towers and galleries offer some of the best ‘tree in temple’ shots aside from Ta Prohm. Constructed in a distinctly Angkor Wat style under the same king that built Angkor Wat, Beng Melea preceded and may have served as a prototype of sorts for Angkor Wat.Though there are some lintel and doorway carvings, there are no bas-reliefs and the carvings are comparatively sparse. When the temple was active, the walls may have been covered, painted or had frescos. 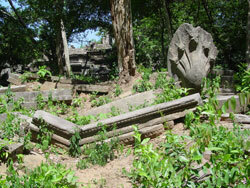 In its time, Beng Melea was at the crossroads of several major highways that ran to Angkor, Koh Ker, Preah Vihear (in northern Cambodia) and northern Vietnam. 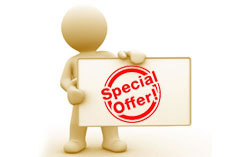 Regular admission ticket are not required but there is a separate $5 entrance fee. Beng Mea Lea is located 63km east of town. 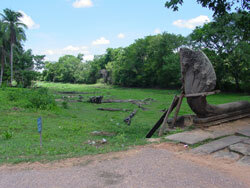 The road is now in good condition and the trip from Siem Reap takes 1-2 hours. Graded dirt road with occasional flooding in the rainy season.